Rockefeller Group Sells New Industrial Building to KKR for $43.5 Million | KKR & Co. Inc.
IRVINE, Calif., Jan. 30, 2019 /PRNewswire/ -- Rockefeller Group, a leading real estate developer, owner and operator, announced today that it has sold a recently completed 406,650-square-foot industrial distribution building to KKR for $43.5 million. 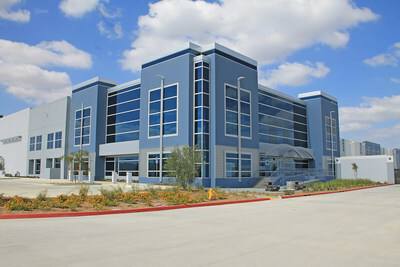 The building, located at Optimus Logistics Center in Perris, Calif., a 1.45 million-square-foot industrial complex, is the second building to be completed and sold at the project, following the September 2018 sale of a 1.04 million-square-foot distribution building to Ferguson Enterprises. "The sale of the last building at Optimus marks an important milestone for Rockefeller Group in the Inland Empire," said James V. Camp, Senior Vice President and Regional Development Officer for Rockefeller Group's West Region. "In less than two years, we were able to develop 1.45 million square feet of industrial space on a speculative basis along the I-215 freeway and complete the business plan by selling both buildings shortly after completion of construction. This success confirms that the I-215 corridor has become a destination for companies who need to distribute throughout the Western United States and also signifies the appetite by investors who see the area's growth potential." Rockefeller Group completed construction of Optimus Logistics Center, which is a joint venture of Rockefeller Group and MBK Real Estate (MBK), in September 2018. "We are excited to add Optimus Logistics Center to our industrial portfolio," said Roger Morales, Head of Real Estate Acquisitions in the Americas at KKR. "This is our first acquisition in the Inland Empire and we are confident that this investment will be attractive to potential tenants. Rockefeller Group has built an excellent asset." "Throughout the escrow process on this sale, there was strong lease activity on this building given the site's direct access to I-215 and proximity to I-10 as well as the growing demand for industrial space by e-commerce companies," said Marc Berg, Vice President and Regional Director for Rockefeller Group's West Region. "We had been negotiating with several tenants prior to closing escrow with KKR and are confident that they will be successful in finding a tenant for the building in the near term." Along with the completion of Optimus Logistics Center, Rockefeller Group completed 425,500 square feet of distribution space consisting of two buildings at Tri-City Industrial Complex in San Bernardino, whereby one of those buildings (Building #2 at 81,286 square feet) sold to 4F Capital in September 2018. "Rockefeller Group is committed to developing industrial distribution and e-commerce facilities in the Inland Empire given the current demand for space in the region," said Camp. "In 2019, the Inland Empire is expected to see continued strong absorption, stable vacancy rates and growing rents. As a result, we will continue our development activities in the Inland Empire and other markets in the Western United States." Mike McCrary, Peter McWilliams, Sharon Wortmann and Scott Coyle of JLL represented Rockefeller Group and KKR for the sale at Optimus. Rockefeller Group is a leading real estate developer, owner and operator, known since the development of Rockefeller Center for pioneering large-scale urban mixed-use development. For nearly nine decades the company has been trusted for its financial strength, stability and vision, and today remains committed to the selective development of innovative, high-quality office, industrial, residential and mixed-use properties in urban centers and strategic distribution markets. Visit RockefellerGroup.com.